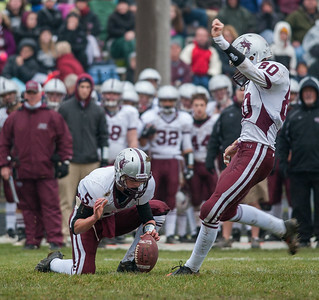 Randy Stukenberg for Shaw Media Prairie Ridge kicker Steven Ladd punts in the second quarter of the Class 6A playoff game in Rockford Saturday, Nov. 16, 2013. Randy Stukenberg for Shaw Media Danny Meikel holds for Prairie Ridge kicker Chris Eschweiler in the first quarter of the Class 6A playoff game in Rockford Saturday, Nov. 16, 2013. 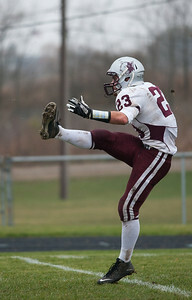 Eschweiler's feild goal gave the Wolves their first score of the game. 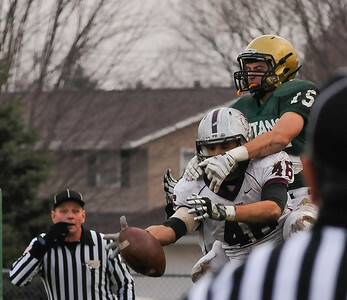 Randy Stukenberg for Shaw Media Priarie Ridge senior Manny Stier (46) breaks up a pass to Rockford Boylan's Brock Stull to prevent Boylan from scoring in the first quarter of the Class 6A playoiff game in Rockford Sat., Nov. 16, 2013. 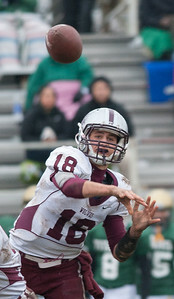 Randy Stukenberg for Shaw Media Prairie Ridge quarterback Brett Covalt throws a pass during the second quarter of the Class 6A playoff game in Rockford Saturday, Nov. 16, 2013. 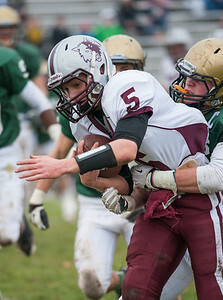 Randy Stukenberg for Shaw Media Prairie Ridge running back Danny Meikel tries to escape the grasp of Rockford Boylan's Quinn Smolonski after catching a short pass during the second quarter of the Class 6A playoff game in Rockford Saturday, Nov. 16, 2013. 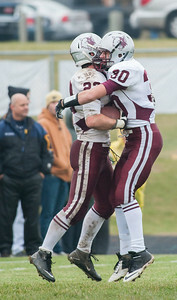 Randy Stukenberg for Shaw Media Prairie Ridge running back Steven Ladd (left) and Joe Weissmann celebrat in the endzone after Ladd scored the Wolve's first touchdown of the Class 6A playoff game in Rockford Saturday, Nov. 16, 2013. 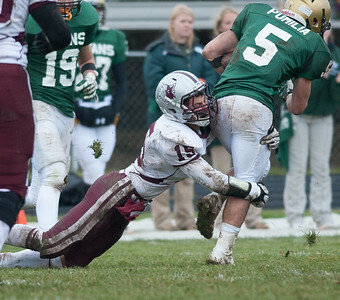 Randy Stukenberg for Shaw Media Prairie Ridge quarteback Brett Covalt looks for a receiver behind blocking by Zack Greenberg (left) and Brett Anderson (right) during the Class 6A playoff game in Rockford Saturday, Nov. 16, 2013. Randy Stukenberg for Shaw Media Prairie Ridge's Nick Gregory tackles Rockford Boylan receiver Nick Pumilia late in the fourth quarter of the Class 6A playoff game in Rockford Saturday, Nov. 16, 2013. 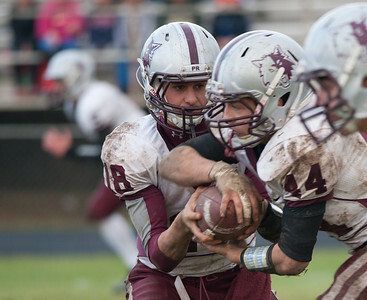 Randy Stukenberg for Shaw Media Prairie Ridge quarterback Brett Covalt hands off to fullback Zack Greenberg during the second half of the Class 6A playoff game in Rockford Saturday, Nov. 16, 2013. Prairie Ridge quarteback Brett Covalt looks for a receiver behind blocking by Zack Greenberg (left) and Brett Anderson (right) during the Class 6A playoff game in Rockford Saturday, Nov. 16, 2013.